SQA was enormously proud to be named as a national corporate parent in April 2015. As a corporate parent, we have a duty to provide care-experienced young people with the kind of support that any good parent would give their own children, to ensure that all aspects of their development are nurtured. 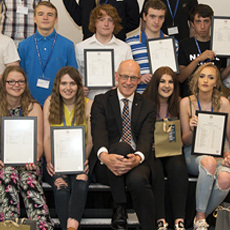 At SQA, we are committed to helping our care-experienced young people realise the brighter futures they deserve. Our first Corporate Parenting Plan, published in March 2016, set out the actions we agreed to take during 2015-18 to make a difference to SQA's care-experienced young learners. Over the last three years we have worked hard to meet our responsibilities as a corporate parent. We have embraced the opportunity to engage with care-experienced young people, to listen to their aspirations and to explore with them what they need and can expect from us. In April 2018 we published our leaflet ‘SQA is a proud corporate parent’ to report the progress we have made to meet our corporate parenting responsibilities. SQA is in a unique position to make some very clear guarantees to Scotland's care-experienced young people. We recently revised and consulted on our draft corporate parenting commitments (109 KB) and will shortly publish our Corporate Parenting Plan for the next 3 years to show how we aim to make a difference. We are grateful to everyone who took the time to share their feedback on our revised commitments. Your input has been extremely helpful. In particular we would like to thank members of the Young People's Champions Board, Who Cares? Scotland, our internal Corporate Parenting Steering Group and colleagues across SQA for their support and guidance. In collaboration with Glasgow City Council's Care Leaver's Service, we have agreed a process to allow care-experienced learners to authenticate their SQA qualifications quickly and easily. In certain circumstances, we will provide a replacement SQA certificate to care-experienced young people (26 years and under) without charge, following confirmation with the appropriate local authority of our learner's care status. We are currently extending this service across other Scottish local authorities. Please visit our Replacement Certificate Service page to find out more.